Headquartered in Istanbul, the business has a showroom in New York and now has a dedicated trade showroom in the architectural design district of Clerkenwell. 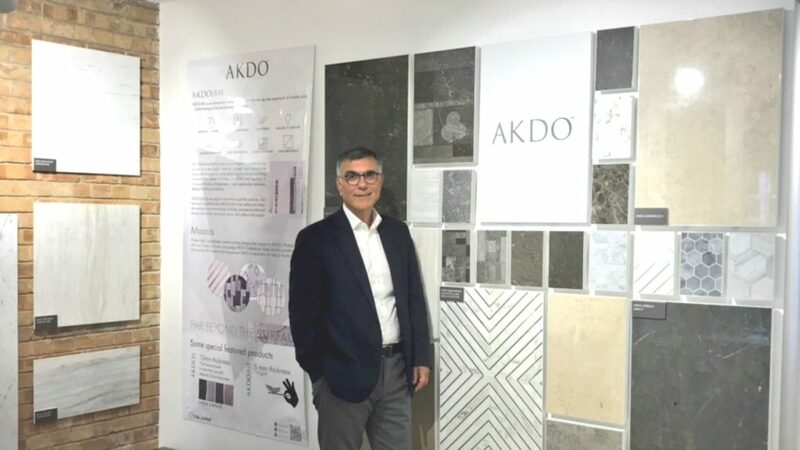 AKDO supplies stone to architects and designers who work in hospitality and luxury residential developments, as well as those in the yacht industry. Chairman Erdogan Akbulak said the move to open a showroom in London was so the company could be closer to UK architects, which influence and supply the global market. Now adding to its portfolio, AKDO has just launched Akdolam Edge, which has been created to provide natural stone to designers previously restricted by budget. The 5.5mm thick stone, which measures 600 x 1200mm, is suitable for wall and floor applications in bathrooms and can be fitted over existing coverings. Akdolam Edge has also been created to combat the challenge of engineered stone and porcelain, which is challenging the natural stone market. Erdogan Akbulak commented: “Engineered stone or porcelain slabs have already taken market share from natural stone. I think this [Akdolam Edge] could be an answer. It has been reflected in the interiors trend hypernature, where man-made products echo nature.